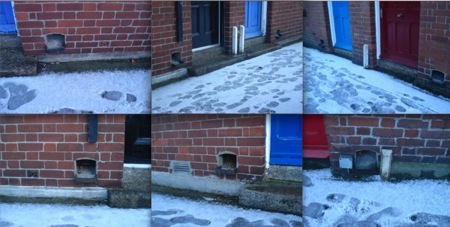 Inspired by I.W.’s piece on boot scrapers in Eton, and by my move in the last month to a new neighbourhood in Dublin, I would like to use some observations on some boot scrapers as a way of introducing two new related terms that may enter that narrow and fast-moving channel, the Slab mainstream. The terms in question are waltritus (wall + detritus) and necoration (non + decoration). The first image here is classic waltritus. 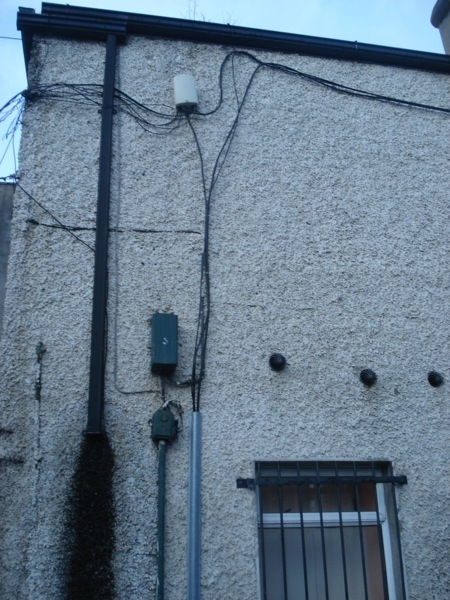 This featureless and yet busily adorned wall in a Dublin alley displays a downpipe, double guttering, staining, wiring, a wiring sheath, window bars, vents, various boxes and traces of former installations. No decision was made to make this wall like this, yet many separate decisions have been made to achieve this end result. If waltritus is the material object or objects that we can see, then necoration is the process by which it gets there. Necoration is the unplanned, taste-less, undesigned, ad hoc embellishment of an existing structure. Now onto the boot scrapers. 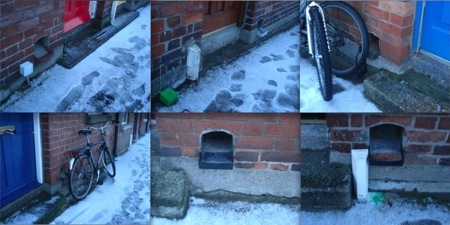 These photographs were taken on a snowy January afternoon in a network of small Victorian streets of workers’ housing in and around Lennox Street in Dublin 8. The boot scrapers are all identical and very simply fashioned. The more we look at these boot scrapers, the more their individuality begins to emerge. The one above has been painted the same colour as the front door, for example. This is perhaps not necoration, rather a deliberate aesthetic decision. Then again, it was most likely the most sensible, ad hoc decision for the painter who noticed the rusting hoop beside his or her bucket of light blue paint. Further observation reveals true waltritus and necoration, however. 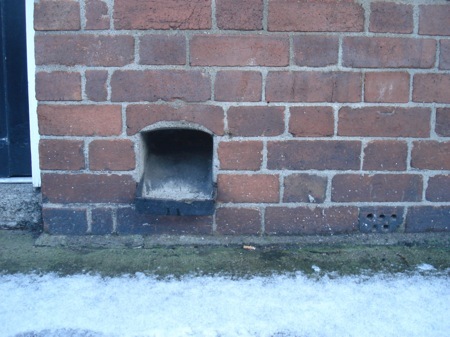 A thin white plastic housing has been installed to cover gas pipes on many houses, for example. There are also small green boxes affixed to cables, as well as plain metal boxes, and modern ventilation grilles have been inserted. 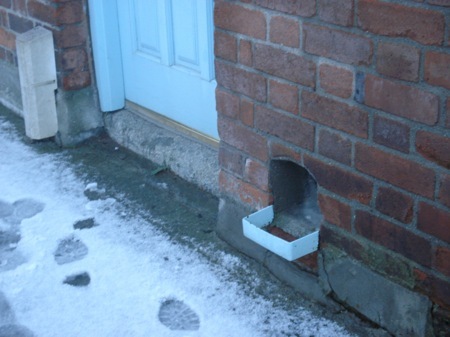 In some cases the boot scraper has been removed, while in others the cavity in the wall has been painted. For some it has use-value, while for most I suspect it hardly exists at all. When it is used, it is for locking bikes. Every boot scraper is clean, with no sign of being used for cleaning shoes, even when they are caked with snow. We find ourselves paying attention to the small adjustments made to door sills. Some have tiles, some not. Some doors have a hinged lip to let the rain run off, while others have brass strips housing draught seals. Some people paint their door a different colour to the narrow frame around it, while others don’t go to the trouble. Some have retained the antique-looking perforated ventilation bricks. They are often to be found at the least well-kept doors, and at doors of the most conservative, dark colours. Are they a marker of poverty? The aim of these admittedly monotonous image is not to reveal or document detail, rather to show how waltritus has an accumulative, unselfconscious and monotonous effect. Necoration is a process that is the result of a combination of neglect, year-to-year maintenance and renovation, so we tend not to see it, or rather we tend to regard it as a process of natural change.